HÀ NỘI — Defending champions Hà Nội FC jumped to V.League’s top position after trouncing HCM City 4-0 on Sunday at the Hàng Đẫy Stadium. No goal was made in the first half, although many attempts were made by both sides. Captain Nguyễn Văn Quyết opened the score at the 50th minute with a fast and furious finish. Keeper Đinh Xuân Việt guessed the right direction but was not quick enough to stop it. Three other goals were scored in the last 10 minutes of the game. Đỗ Hùng Dũng headed strongly to the net when he caught the ball that bounced back from Việt, who tried to save his net, at the 80th mark. Oseni Ganiyu Bolaji made it 3-0, with a close-range tap-in four minutes later. He then broke HCM City’s defence to pieces with his solo performance to near the box before sending the ball to teammate Hoàng Vũ Samsam, whose finish allowed Việt to enter the net. With the win, Hà Nội have 42 points as many as Quảng Nam FC and FLC Thanh Hoá, but they take the No 1 spot due to the higher goal difference. HCM City, with 25 points, were down one place to No 11. Sông Lam Nghệ An sent Long An to the First Division next season after beating them 3-2 at the Vinh Stadium on Saturday. Phan Văn Đức opened the score for Sông Lam Nghệ An at the 50th minute. Hồ Phúc Tịnh and Trần Phi Sơn added two more goals near the end of the game. Long An’s Wander Luiz Queiroz Dias made a double at the 67th and the last second. Long An knew their destiny although there are two games to play before the end of the tournament. The team spent most of their time at the bottom of the table. They have won only two, drawn four but lost 18 matches. After 24 rounds, Long An gained only 10 points. Sông Lam Nghệ An meanwhile stayed at No 8 with 31 points. Sitting in the press conference room with great sadness, coach Nguyễn Minh Phương expressed his disappointment as he had failed to save the team since he took on the responsibility from this February. “It is a sad memory for myself and Long An Province, when our effort was not enough to avoid relegation,” said the former national midfielder. “However, we accept the failure with a comfortable spirit because for me, it is a chance to start from the beginning so that Long An can quickly return to V.League as soon as possible. “We also take time to look at the loss and review what we did and what we need. I want to say thanks to our supporters. They will be a strong force to push us up,” he said. In the other match, former champions Hoàng Anh Gia Lai enjoyed their first victory at the Thống Nhất Stadium after 15 years when they beat hosts Sài Gòn FC 2-1. All the goals were headers. Trần Minh Vương headed at the 58th mark for the visiting side. Thân Thành Tín levelled just 15 minutes later for Sài Gòn. Mobi Fehr scored his goal five minutes to the end, marking Hoàng Anh Gia Lai’s second win under the reign of the new coaching board, which includes head coach Dương Minh Ninh and technical director Chung Hae-song. “It is great that Hoàng Anh Gia Lai is pocketing a win here after a decade and a half. We just lost and drew here during that period,” said Ninh, adding that it would be a historic win for his team who played a good game and deserved to have three points. Hoàng Anh Gia Lai made their personnel changes after losing four matches in a row. The new board seems to be doing a good job, with one draw and two wins. “Results from three recent matches show our progress. With director Chung’s help, we changed, and we see the positive signals. Of course it is early to say anything now because we just started and there are challenges ahead. Hope we will go far in the tournament,” Ninh said. In other games, Hải Phòng beat SHB Đà Nẵng 2-0 and Cần Thơ lost 1-2 to Sanna Khánh Hoà. 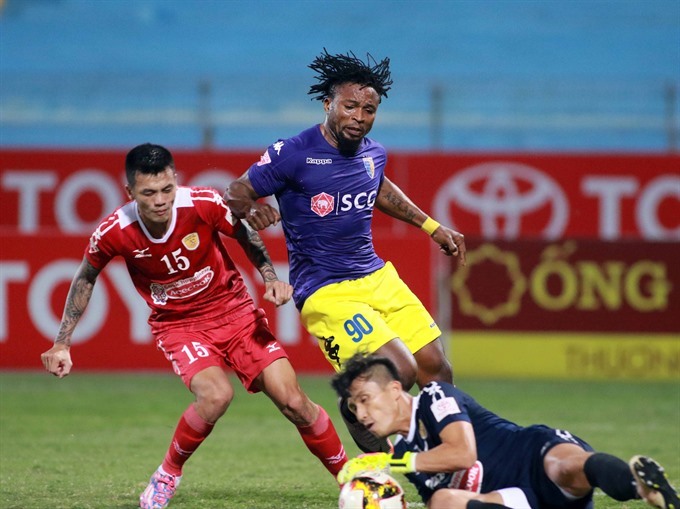 A key match of the round between second-placed team Quảng Nam FC and Quảng Ninh Coal was delayed for the second time because of the Damrey typhoon. Quảng Nam Province is one of the destinations that suffered from the storm. The provincial stadium was heavily flooded, while the bad weather was not suitable for any activity.